Following the travels, triumphs and travails of Kevin, Erin, Jad, Danna and Kyler Rubesh as they travel the globe. Jad and Danna love to dance, be it the two-step, the limbo, or the bunny hop!! What made this dance party so much fun was that they were with their cousins -- the big ones (Christopher and Cory) and the younger ones (Isaiah, Joseph, and Savanah). Being in Oklahoma in June, we were able to attend part of the Red Earth Festival -- one of the largest gatherings of Native Americans in the world. The costumes and outfits were stunning, to say the least!!! I wish I had Kevin's zoom lens -- my little photos just don't do justice to the exquisite cl ot hing of so many tribes. 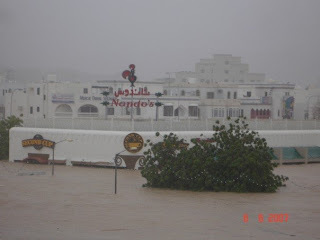 Cyclone Gonu hit Muscat this week, leaving flooded homes, wrecked cars and widespread destruction in its wake. Cyclone? 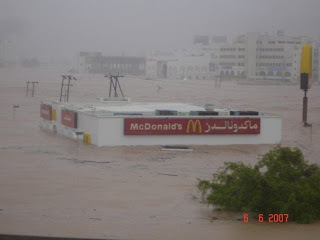 In Oman? Really - no kidding! It's the strongest cyclone ever to hit the Arabian Gulf - an area not known for many storms to begin with. More pictures here on Flickr. Here's a pretty good writeup of some of the aftermath of Gonu in Muscat. We just got word today that some good friends of ours had their house destroyed in a mudslide. Please be praying for these friends and others whose lives have been turned upside down by this freak storm. The pace of modern travel still baffles me. Last week, I had dinner in Muscat, walked the rainy streets of Zürich in the morning, and capped my cross-Atlantic flight off with an afternoon jog around the National Mall in Washington, DC. Three continents in less than 24 hours - amazing! If you're making a flight through Zürich, have a couple hours to kill, and want to slow the trip down a bit, read on. I had five hours to burn in Zürich en route from Muscat to DC, and figured that a walk in the fresh air of Switzerland would do my cramped legs some good! Unless you really like carrying your carry-ons around town, leave them at the left-luggage office on the ground level below Check-in Area 2. Follow the signs for "Gepäckaufbewahrung / Left Luggage." The left luggage office is down the corridor behind the Information / Service Center at the top of the escalator leading to Check-in 2. The left luggage office charges varying prices, based on the size of your bags, and the amount of time you plan to leave them there. Check the price schedule above for details. If you have Swiss Franc cash, the other option is to rent a locker - they'll put you back 6 Francs for a medium locker or 8 Francs for a larger one, and should accomodate most average carry-ons. The luggage lockers are to the left of the Information / Service Center, and to the right of the bank of elevators. Freed from your bags head down toward the train station. Look for the sign that says "Bahn / Railway". The train station is in the basement - under the Check-in 2 building. Buy a round-trip ticket to "Zürich Hauptbahnhoff" (Main train station). If you have Euros or Swiss Francs (CHF), you can use the automated ticket machine (you'll get change in CHF, no matter which currency you use). 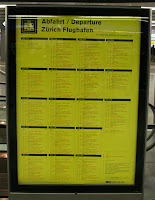 Check the bright yellow Departures schedule board to locate the next train departing to the main train station. Look for "Zürich HBF" or "Zürich HB" on the schedules. The departure board will list the train number ("S 16", for example). You'll use this number to figure out where to catch your train. Ticket in hand, head for the train platform, one level below the ticket windows. The trip downtown will take about 10 minutes, and there should be a train every 10-15 minutes. Hop on the train and enjoy the scenery as you pass through the suburb of Oerlikon, and then continue on to Zürich proper. When you arrive at the Hauptbahnhof, make your way to the main terminal (the train I came in on arrived at a set of tracks outside the main terminal building). Exit the main terminal building and cross the tram line to head south along Bahnhofstrasse - one of Zürich's premiere shopping streets. The boulevard is lined with famous brands, coffee and tea shops and "private banks" (with numbered accounts?). If you get tired of walking, a tram line runs right up the center of the street - just buy a ticket at machines along the street, and hop on board! After about 3/4 of a mile, you'll reach Bürkliplatz, on the northern shore Lake Zurich. When I came through in late May, the plaza was filled with fruit and vegetable stands - a great spot to grab a quick and healthy snack before heading back to the train station. 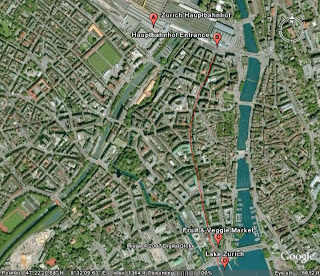 For a little more variety on the return trip, cross to the East bank of the Limmat river, and walk back north along the bank to Bahnhofbrücke, where you can turn left, crossing the bridge back to the station. Back at the station, look at the main departures board for trains leaving for Oerlikon and Flughaven Zürich. If you're trying to situate the airport on the rather confusing train maps, it's to the Northwest of town. Check out all our videos here, or click the links below to view our most recent videos directly. The views expressed in this blog are those of the author and not necessarily those of the U.S. Government, or of any agency or department of that government.